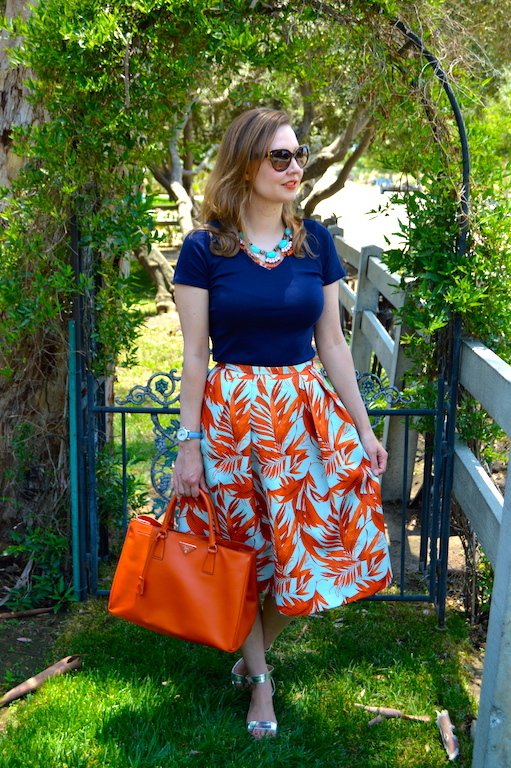 I discovered this orange palm frond skirt either on someone's blog or Instagram account, which only speaks to the addictive nature of following other fashionistas on social media! The good news is that regardless of where I discovered this midi skirt from H&M, it was half off with free shipping, so at $24.99 it didn't do too much damage to my bank account. 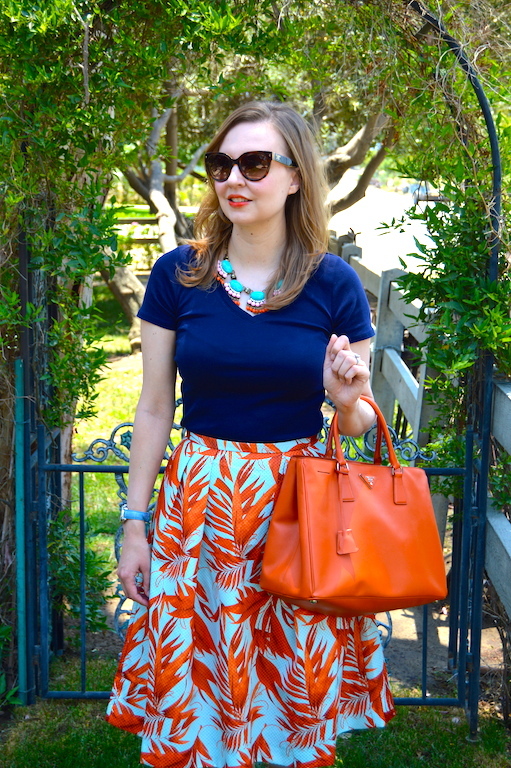 I wasn't sure what exactly to pair the skirt with, but I figured I couldn't go wrong with navy and of course my orange tote. With the excessively hot weather we have been having in Los Angeles, it's nice just to throw on a comfy tee like this navy one that is light weight and can easily be tossed in the wash afterwards. Even though I like to be fashionable, I also like to be comfy and somewhat practical! While figuring out what to pair the skirt with took a little bit of thought, deciding on a perfect location to wear the skirt took no thought at all. 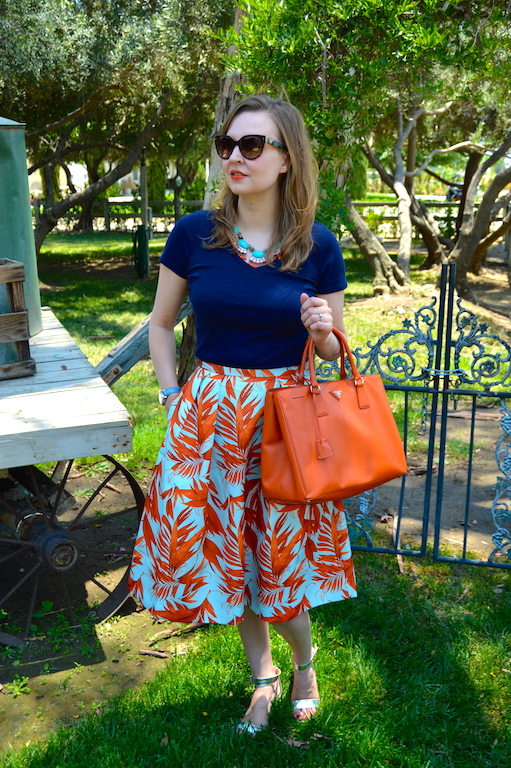 I wore the skirt out on its maiden voyage to a favorite nearby vineyard for some wine tasting. One of the great things about Los Angeles is that there are still some vineyards, which actually date back to before Prohibition, where you can get some delicious and reasonably priced wines. 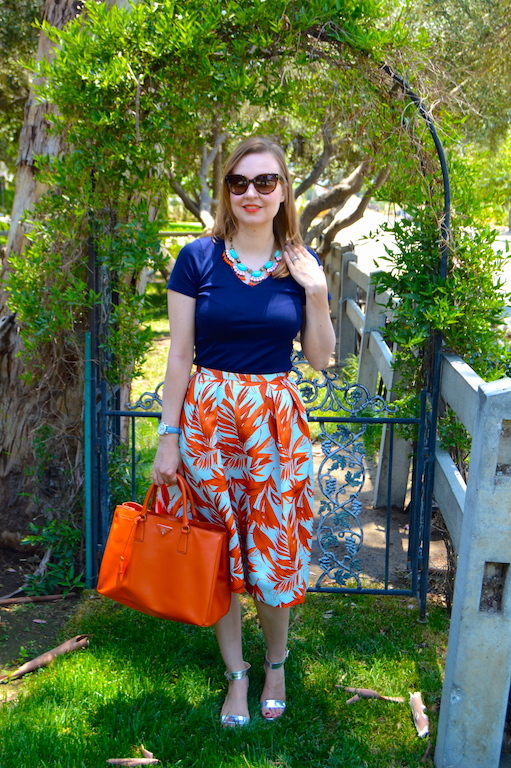 While I realize that the skirt with its bright orange palm print doesn't officially have anything to do with wine or vineyards, why sweat the details? It's hot enough already! LOVE IT! The skirt and necklace are my favorites from this look! Love this! I love blue and orange together, but it can be so difficult to pull off. You look amazing in it! Great skirt .. love the orange/blue colour combo. Such a gorgeous outfit. Love that pretty skirt. And the navy top goes perfectly with it. That is one gorgeous skirt Katie and the necklace matches it perfect! So lovely, loving this skirt too, no wonder you snagged it. I love that color combo, it's one of my favorites. Such a cute outfit! What a gorgeous skirt! And the navy top is the perfect color combination. Simply adorable! I love that skirt--I can't blame you one bit for tracking it down and buying it. I love how your necklace really plays off the colors too--they work so well together. I can't really work that silhouette right now, but I plan to stock up on pretty, printed full skirts post-baby--LOVE those and don't have enough! 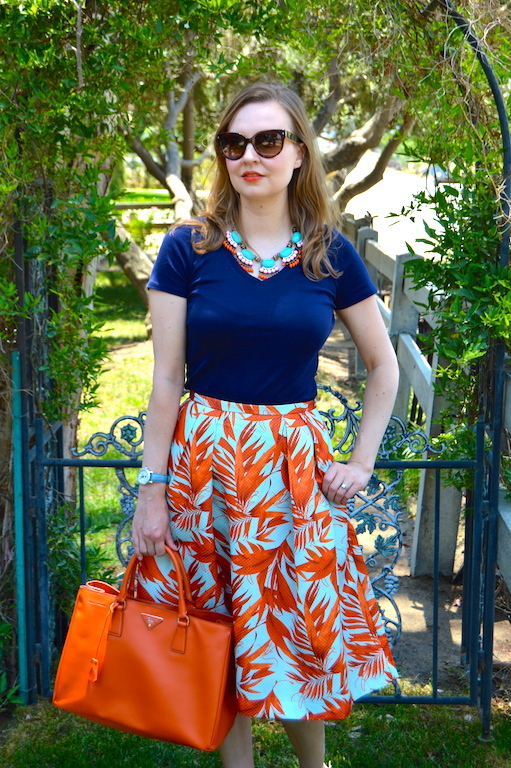 Blue and orange is one of my favorite combos-great look! I love this combination of navy and orange. Gorgeous bag and of course the skirt was a steal! I love this look! I tried on that skirt at H&M and loved it, but was clueless about how to style it so I passed.